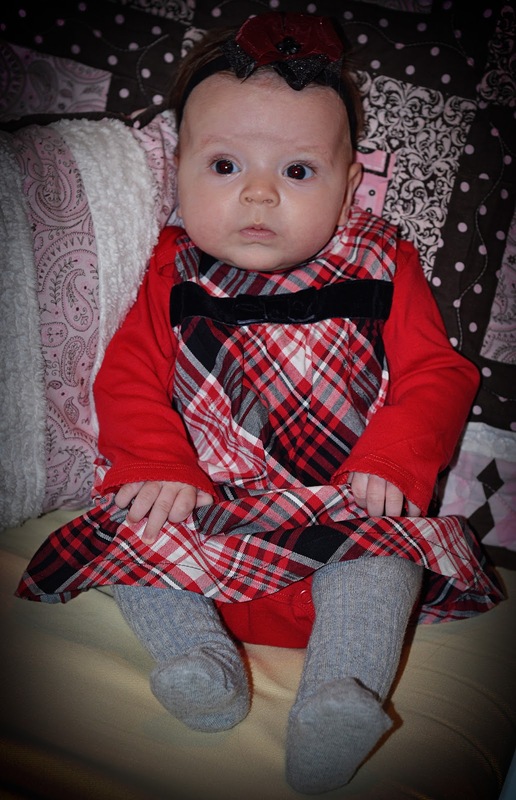 Brinley in her Christmas dress. This was taken right when it was time for a nap, so you can see the “tired stare” she gets when it is time to sleep. This is a summary for Brinley’s 17th week; she was 16 weeks old. She had some fussy times during this week during waktime, which I attribute to wonder week mumbo jumbo. During this week, she pretty much for every nap cried out at mid-nap. Most of the time, it was one little cry, then back to sleep. A couple of times it was a cry, try to fall asleep, cry, try to fall asleep, and she would eventually fall asleep but she was obviously having a hard time sleeping. She had a lot of shorter than normal naps, too. We tried one day of sleeping only in her crib instead of the bassinet. I did it when she was taking short naps anyway…which I thought, hey, she is taking short naps anyway, might as well give this a try. This is against my own advice of trying new things during fussy times. I don’t like to do that normally because then you don’t know if things are rough because it is just a rough day or rough because of the change. I figured we needed to push through it so she could sleep in her crib because some day she will be too big for her bassinet. Then I remembered that Brayden moved from a pack and play at 6 months old with no issues. When McKnena was 6 months old, we moved to a new house with no issues. Remembering this made me realize I don’t need to force something right now. So I moved her back to the bassinet. We will worry about moving out when we have to, and there is no reason for us to move out of the bassinet today in preparation when she will be too big for it in a few months. I know it is counter the idea of “start as you mean to go on” but I don’t think it is the same thing. She will get bigger and less desirous for the coziness of a smaller bed. Plus she will fill out the big crib better as she gets bigger. Eating is going well. She continues to just be fast at nursing. She got to about 5 minutes per side, and she really empties in that time. This is a tricky age because they are starting to get distracted while eating and also getting faster at eating. Because of these two things, it si hard to tell for sure when they are done. That does get easier as they get older. This is our daily schedule. BUT this week could best be described as “Sporadic.” Some days, she followed this. Some days, she took a short morning nap and wanted to eat at 10 instead. She pretty much always had a long nap of the day, but it could be any one of the naps that was long. We always ended right at 7:30 with me waking her up to eat and started at 7:30 with me waking her up to eat in the morning, but the days were sporadic. I always struggled with what to do when my baby didn't follow the schedule. I could handle being 15-30 off and get things back on track, but when she only took half a nap I wanted to throw up my hands and say "Why do I try?". I felt that my baby's failure to nap well was all because of something I did. Would you consider doing a post on how to handle these days? What kind of options do you give yourself? Do you adjust awake times, move bedtime earlier, simply go by the clock and get through the fussiness to start again the next day? Thanks so much for this blog! I am having just the hardest time with my 4.5 month old and his schedule. I did bw with my first daughter and she was textbook, sticking right on the schedule and sleeping through the night at 8 weeks. So I've worked through the bw model before. Which is why I am so frustrated it's not working right with my son. I started from when he was born and now at 4.5 months, we're still not sleeping through the night and still not sticking on a schedule. Ugh!! I'm so frustrated. I hope you can see something I can do. I could never get him to take a dreamfeed- too sleepy, tried everything. He's been going down at 7pm and waking at 4-5am for a feeding then sleep til 7am since 2 months. It's not habitual as it can be anywhere from 3:30 to 5:30 am. I feed him only on one side and just for a few minutes. He seems to be getting worse now (I'm attributing this to 4 month sleep disruptions). We unswaddled a couple weeks ago and he's in a Merino sleep sack. As for our schedule:7am- wake and feed (usually will not take a full feeding)8:30- feed and nap (I know, totally against all bw principles, but since he won't take a full feeding he is hungry and will wake up at 45 minutes into nap, guaranteed. He doesn't fall asleep nursing- usually cries 5-10 minutes then falls asleep on his own)10:30-11am- feeding12:30-1pm- feeding and nap (If I dont feed him, he will wake at 45 mins, if I don't give him 2 hour wake time, he will wake at 45mins. I've tried as little as one hour wake time and he will scream for 30 minutes bc I think he's just not tired enough to sleep).3-3:30- wake from nap4pm- feeding- Will absolutely not take a 3rd nap in the last 2 weeks. I've let him cry up to an hour and he will not sleep. Before time change, he would take 3rd nap if I put him down before 4pm, if any later, he would not go down.7pm- feeding and bedtimeOk, I realize there are so many principles out the window, but as hard as I tried to put him on a typical bw schedule, he just would not sleep through his naps and if he doesn't take a full feeding first thing in the morning, it throws the whole day off, which is why I've adjusted it as such. Should I just fight it and try to put him on the paper perfect schedule or just go with what works for my little guy? I'm not nursing him to sleep, so he's falling asleep on his own. He's also a pretty hefty guy, so I know he's getting enough food. I just feel like I'm doing it all wrong! Is there any suggestions you can make for me?? Please help! I'm not the babywise mom, but I may be able to offer some advice. We were in a very similar situation. My first son was textbook BW baby. STTN by 7 weeks and you could set your watch by his schedule. My daughter on the other hand was not STTN and it was getting really frustrating to me. So I read somewhere that the dreamfeed can throw off their sleep cycles. So at about 3.5 months I dropped her dreamfeed cold turkey. And she immediately started sleeping longer. Not through the night, but longer. Then I noticed that when she did wake at night and I fed her- even a half feeding, that she wouldn't take a full feeding in the morning at 7. This let me know that she didn't need that MOTN feeding. So I started trying the pacifier when she woke in the MOTN instead of immediately trying to feed her. Most of the time it works. She goes back to sleep and then wakes at 7am and has a full feeding. These two things have helped tremendously to get her to sleep longer. She often will sleep through the night now. Sometimes she still wakes, but we are getting there! I feel like we are making progress and I'm not a failure. All that to say- if these things don't work for your little guy, do what works! Every baby is different and you don't want to stress about not being on a perfect textbook schedule. Good luck! Thank you, Dana! He unfortunately will not take a pacifier and since he was a newborn was near impossible to soothe to sleep. It's like he needs to cry to release energy and settle himself back down. I'm trying CIO but can only hack that one time a night. So one time I let him CIO the next time I feed him. I'll keep trying some different things. Thanks for the encouragement that I'm not a bw failure. I'm wondering how you personally handle those days with short naps. Do you revise your schedule and stick with a 1hr or less awake time? Or do you stick to the normal times you usually put her down?When she fusses at night or nap about how long do you let her cry before checking things out? Thanks for all of the details you share. They are so helpful! Hi, I'm following BW with my 17 weeks old since he was 4 weeks and everything was working out perfectly since 2 weeks ago. Thats when he started taking naps that only lasts 30 minutes, to the mark. I have tried putting him down earlier, later, feeding 0 sooner, leaving him alone in th crib for about 10 minutes, rocking him back (unsuccessfully). Nothing has worked. Should I accept that now he only takes short naps? What would you suggest? My son will turn 4 months next Monday (August 5), so he is right at this age. He was going from 10 to approximately 6 am for a long time, then a few weeks ago he started to roll over. He'd get up at all hours of the night fussing because he'd rolled and couldn't go back to sleep (he's a tummy sleeper). This is still going on. There have been several instances where I've just fed him during the night because he wouldn't go back to sleep unless I did. Perhaps the waking had something to do with a growth spurt, which I can understand. But this has been going on for a while now and it's becoming a real pain. Last night he rolled once at 2:30 and I went up and rolled him back over and he went back to sleep until 5:30. The past 2 nights I've been keeping him up from 6:30 to 9, when I feed him and put him down immediately. He's usually exhausted by this time. I do this in hopes of helping him not wake during the night, but it's not working. Could it be backfiring? Before this started happening, our routine was as follows: Wake up at 6 and nurse (he's exclusively nursed at this point and weighs almost 20 pounds, btw), down for nap at approximately 7:15 or 7:20 after waketime, eat at 9 or 9:30, nap at 10:45-ish, eat at 12 or 12:30, nap at 1:45 or 2, eat at 3:30 or 4, nap at 5-ish, eat at 6:30 or 7, bed at 8 or 8::15, dreamfeed at 10. So, the last couple nights, his 9 pm feeding is not really a dream-feed because he's up from 6:30 until then. I felt the dream feed was not helping because he'd be out like a light at 10 and sometimes wouldn't wake up enough to eat well. Anyone have suggestions on what they'd do? There has to be a reason for his wakefulness at night. Is he overtired? Thanks for any advice!